Taxman Was Right MJ Collection Worth a Fortune! The Michael Jackson Estate is in the crosshairs of the IRS for allegedly cheating taxpayers out of a fortune ... and now the taxman wants the Estate to pay the piper -- to the tune of more than $700 million. The allegations are stunning. According to legal docs -- obtained by the L.A. Times -- when Michael died the executors told the IRS his net worth was around $7 million. 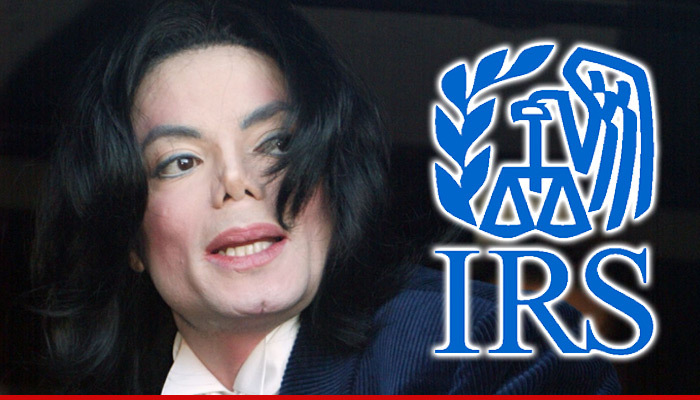 The IRS now says MJ's net worth was actually $1.125 BILLION! And in a HIGHLY unusual move, the IRS claimed executors so grossly misled the agency, it doubled the tax penalty -- from 20 - 40%. So the IRS claims the Estate didn't pay $505 million worth of taxes, and when you add the 40% it comes to more than $702 Million. -- The Estate valued MJ's likeness at $2,105. The IRS says the value is actually more than $434 million. -- The Estate valued Michael's interest in a trust that owns songs by MJ and the Beatles at ZERO! The IRS says its more like $469 million. -- There's another MJ trust the Estate claims is worth $2.2 mil. The IRS says it's worth $60.6 mil. -- The Estate valued the Jackson 5 master recordings at $11.2 mil. The IRS says $45.5 mil. It's pretty clear the Estate will fight this like crazy, but worst case scenario the taxes could wipe out what the Estate has made since MJ's death ... which could be devastating for Michael's kids. We contacted a rep for the Estate who says they stand by their initial statements on the matter ... telling us, "The Estate of Michael Jackson disputes the IRS position in its entirety." The rep adds, "The Estate used independent, nationally-recognized and highly-qualified expert appraisers in determining the value of the Estate’s assets. By contrast, the IRS consultant’s values are not based on standard appraisal methodology, but rather are speculative and erroneous assumptions unsupported by the facts or law. The Estate has paid over $100 Million dollars in taxes and is in full compliance with the tax laws."